Cyclamen are great plants for growing in woodland shade and come in stunning shades of pink and also white. 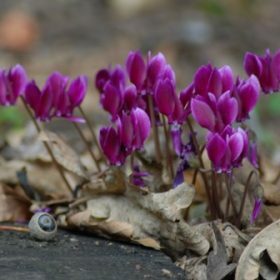 Red Sky is a relatively new strain of cyclamen and we think it is quite superb. The flowers are a deep purple/red and the foliage is variegated so offering a lovely contrast in the garden. 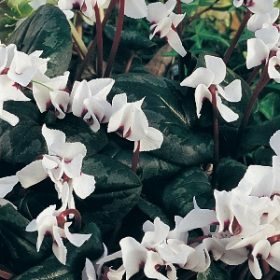 The flowers are a pure white and quite long lasting although you can also enjoy the foliage for a much longer time.